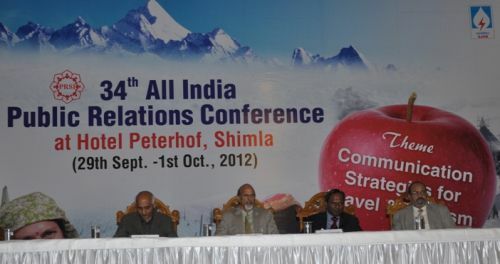 The 34th All India Conference on “Communication Strategies for Travel and Tourism” organised from 29th September to 1st October, 2012 in Shimla by Public Relations Society of India was a unique conference of its kind. The participants from different parts of the country and abroad took part in the conference and PR practitioners, communicators more than 200 in number from Government, Private and Public Sector Undertakings participated in the Conference and renowned experts from various parts of the country from renowned institutions, Media Institutions and abroad expressed their views in six business sessions organised during 3 day conference. Perhaps this was for the first time that such meaningful conference had been held in Shimla. From the deliberations of the Conference it emerged that tourism has become integral part of economy of the world and the facilities and tourism destinations should be promoted in the right perspective and it is the need of the hour to sell the experiences not the destination. For this, right communication strategies would have to be adopted. A. Juggessuer, the High Commissioner of Mauritius, Chief Guest at the inaugural session of conference highlighted the tourism development in Mauritius. He said that tourism had vital impact on local and national economy and now, various organizations were taking services of Travel and Tourism Agencies for branding their image. He said that tourism contributed 8.4 percent in the total GDP of Mauritius and political stability, sustainable environment effective policy had resulted to boost tourism in the country. Ajay Mittal, Additional Chief Secretary who presided over the inaugural session stressed upon the need of development of tourism and highlighted the role of communicators in it. During this three day conference, six sessions were organised and more than 200 delegates from various parts of India and abroad expressed their views. Bhim Sen, Chief Information Commissioner said that the role of Public Relations had become more important in the era of globalization and liberalization and it has become important part of every institution. He said that tourism had become most important source of livelihood. Ajit Pathak, National Chairman, PRSI said that job of PR was building images and the PR professionals should abstain from indulging in unethical practices which may harm the organizations. Dr.C.V. Narsimha Reddy former National President, PRSI and Editor of ‘Public Relations Voice’ said that tourism development can be successful only when there was effective PR of any organization. MJA Sheehan, Editor, Asia Pacific Public Relations Journal, School of Communication and Creative Arts, Deakin University, Australia expressed his views on ‘The Language of Tourism: Perfecting Soft Skills in a flat world. Prof. Vibhavari Kumar, Chairperson, Fashion Communication Department, NIFT New Delhi expressed her views on ‘Fashion Tourism’. Shri R.P. Singh, Chairman and Managing Director, Satluj Jal Vidyut Nigam, Shimla and Shri N.L. Sharma, Director (Personnel), SJVNL spoke on ‘Corporate Social Responsibility: Launching Pad for Repositioning Corporate Image while Shri Tej Bahadur Mathur, Head, Corporate Communication and CSR, Hindalco, Renukoot expressed his views on ‘Employees as Ambassadors of Corporate Organizations’. Shri Unmesh Dikshit, Vice President (West), PRSI stressed the role of communicators in the promotion of tourism. Ms. Monisha Mitra, Managing Director, White Paper Consulting, New Delhi spoke on ‘Communication that can hold your tourists back with you’. Shri Anuj Dayal, Head (Corporate Communication) of Delhi Metro, New Delhi delivered on ‘International Tourism Potential of Metro Trains. Shri Madan Bahal, Managing Director, Adfactors PR Pvt. Ltd., Mumbai expressed his views on ‘Financial Communication’. Shri Dinesh Kumar, Associate Editor, The Tribune and Shri Himangshu Vatts, Senior Editor, The Economic Times, New Delhi expressed their views on ‘Making Corporate Communications more saleable to Media’ while Shri Philip Abraham, Head (Corporate Strategy and Marketing) REI Six Ten Retail Ltd., New Delhi delivered on ‘Social Media as a PR tool in travel and tourism sector’. Shri Manjul Tiwar from NTPC, New Delhi spoke on ‘Sustainability and Branding’. Shri Y Babji, Vice President (South), PRSI expressed views on role of media and Smt. Manju Wadhwalkar, Head Corporate Communications, PGI, Chandigarh expressed views on ‘Medical Tourism-Strengthening International Bonds’. Shri Sanjay Roy, Vice President (Corporate Communications), DLF, Gurgaon spoke on ‘Golf as a tool for Tourism Promotion’. Prof. Ram Ji Tripathi, Makhan Lal University, Bhopal expressed his views on ‘Catalyst Role of Media in Tourism Promotion’. It is pertinent to mention here that PRSI, Shimla Chapter came to existence in 2006 and has been conferred PRSI National Awards for three times. Shri B.D. Sharma, Chairman, PRSI, Shimla Chapter had been conferred Best Chairman Award twice in 2009 and 2012.